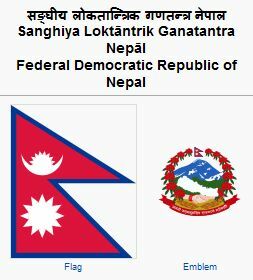 The Federal Democratic Republic of Nepal is a landlocked country in South Asia. It is located in the Himalayas and bordered to the north by the People's Republic of China, and to the south, east, and west by the Republic of India. It has an area of 147,181 square kilometres (56,827 sq mi) and a population of 28,875,140 (2007 census). Kathmandu is the nation's capital and the country's largest metropolis. The northern part of the country has eight of the world's 10 tallest mountains, including the highest point on Earth, Mount Everest. The fertile and humid south is heavily urbanized. Hinduism is practised by 80.6% of the nation's population, according to the 2001 census, while 10.7% are Buddhist, 4.4% are Muslim, 3.6% are Kirat, and 0.5% are Christian. 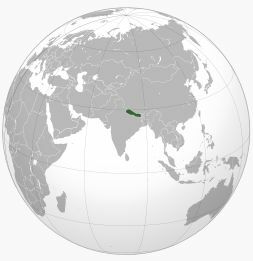 Nepal has been a monarchy throughout most of its history, ruled by the Shah dynasty of kings from 1768 until 2008, when the monarchy was dissolved and a federal republic was formed. Through much of its history Nepal was virtually closed to outsiders. Political changes in 1950 led to a more open stance. In 1951, Christian missionaries were permitted to enter Nepal. The United Mission to Nepal (UMN) was founded in 1954. It is an ecumenical agency through which various mission groups work together. By 1987 the UMN numbered about 400 missionaries from more than 20 countries. They were sponsored by 39 mission boards. Assignments included medical, educational, and economic development work. In 1956, Rudolf Friesen was sent by the Mennonite Central Committee (MCC) to work in Nepal. Later that year two Pax volunteers joined him. In 1957 Lena Graber became the first worker under the Mennonite [[[Mennonite Church (MC)|Mennonite Church]]] Board of Missions (MBM). Since then numerous MCC and MBM workers have served under UMN in professional, administrative, and clerical roles. Maynard and Dorothy Seamons were supported by the Mennonite Brethren Board of Missions and Services after 1960. They were engaged in medical work under The Evangelical Alliance Mission (TEAM) in western Nepal. The Christian church in Nepal numbered about 20,000 in 1986 and was experiencing steady growth despite persecution. In the 1960s the India Brethren in Christ began an informal outreach in Nepal. In 1992 the first Brethren in Christ church was opened, one year after the anti-conversion law was relaxed. In 2009 the Nepal Brethren in Christ Church had 28 congregations with a total membership of 789. Horsch, James E., ed. Mennonite Yearbook and Directory. Scottdale: Mennonite Publishing House(1986-87): 159-160. Mennonite Brethren General Conference Yearbook (1981). Wikipedia. "Nepal." Web. 27 October 2010. http://en.wikipedia.org/wiki/Nepal. Wikipedia. "Religion in Nepal." Web. 27 October 2010. http://en.wikipedia.org/wiki/Religion_in_Nepal. Liechty, Russel A and Richard D. Thiessen. "Nepal." Global Anabaptist Mennonite Encyclopedia Online. October 2010. Web. 21 Apr 2019. http://gameo.org/index.php?title=Nepal&oldid=93037. Liechty, Russel A and Richard D. Thiessen. (October 2010). Nepal. Global Anabaptist Mennonite Encyclopedia Online. Retrieved 21 April 2019, from http://gameo.org/index.php?title=Nepal&oldid=93037. Adapted by permission of Herald Press, Harrisonburg, Virginia, from Mennonite Encyclopedia, Vol. 5, p. 622. All rights reserved.